His grave was exhumed in 2009 by Hizbul Islam. That was the common belief of the people and Aw-Cismaan was a prominent Sufi scholar who allegedly saved Marka from being swept away by the sea. It was believed that through his powers, Sheikh Aw-Cismaan held the sea with his foot and protected the town from being flooded. 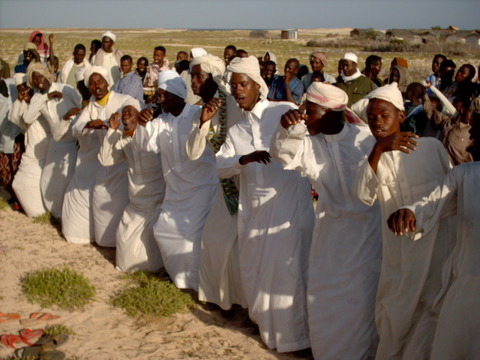 Ceremonies were held and camels were slaughtered in his name; it was the only time the light-skinned Marka girls were allowed to go out and bathe in the sea during the day for the consummation of their marriage to the Sheikh that night, as an elderly Marka man told me. When Sheikh Muhidin’s bones were being removed from his grave in an old sack the people who believed he possessed indefinite powers anxiously waited for a miracle to happen. Fearing the evil consequences of the digging, a steady line of apprehensive residents evacuated their houses and moved as far away from the tomb as possible. I stood by as hammers pounded the concrete of his tomb and local journalists recorded the event, all expecting something to happen. But the only thing they witnessed were bones and dust fill the sack. Sheikh Muxidin was believed to be one of the four people who, apparently, laid the earth flat and he was also responsible for holding back earthquakes from Somalia. Such beliefs were so widespread that gossip of ‘we will be swept under the ocean’ and ‘earthquakes will soon bury us under the ground’ soon filled the city. According to his biography, written by his student Sheikh Ali Mu’min, the Sheikh has never been seen praying in over forty years. It is also claimed that he comes to earth every night in his human form and saves people from calamities. Biyamaalow was another great Sufi saint thought to be a source of salvation for those who came to his grave. It was a common custom that whenever people went to visit the tomb of Biyamaalow they would enter prostrating. Beside his tomb was a pile of sand, perfumed every morning and night so that whoever came there left with a handful of the fragrant sand of the saint. Women who could not bear children went to his grave and implored him of his favours and intercession. Today a pile of rubble is the only thing that indicates the existence of Biyamaalow and every now and then one or two people come to the grave only to etch the pitiful remains of the saint in their memory. The above are the major Sufi scholars exhumed in an Al-Shabaab sweep. Other Saints dug out from their graves include: Sheikh Ali Mu’min, Sheikh Abdi Liiban, Sheikh Ali Abdulle, Sheikh Adan Dheere and Sheikh Nuur Osman.